After leaving the Marine Corps, the Iraq veteran returned to his first career as a dancer — an unconventional trajectory either way you look at it. 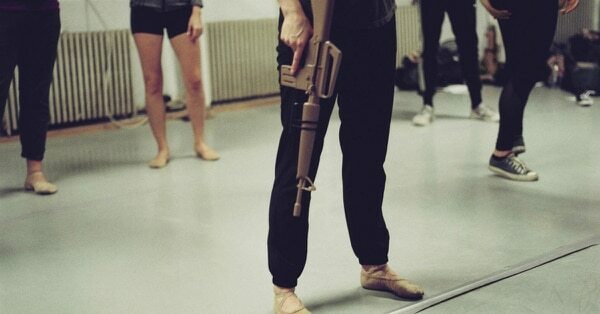 But he’s found a way to meld the two worlds the way only someone who’s lived both lives can do — by starting a dance company and choreographing ballets about war. “When I started this idea, it started as a way to investigate experiences that I had in Fallujah, in Iraq, as a Marine,” Baca, 44, said in a recent interview. Since then, his company, Exit 12, has become a traveling nonprofit group that performs contemporary dances and runs therapeutic movement workshops for veterans across the country. Baca’s unusual story is featured in a new film, “Exit 12: Moved by War,” which was featured on Vimeo last month and has just been nominated to receive an award in the Documentary Shorts category at the 2019 SXSW film festival. After studying dance at the University of New Mexico, Baca started dancing professionally on the East Coast. But sometime in between ballet performances of Tchaikovsky’s “Swan Lake” and “The Sleeping Beauty,” the then-20 something decided he wanted to do more with his life. So Baca gave away all his dance gear and joined the Marine Corps, a career he felt epitomized his dream of a living a life of service. But life has a funny way of not going as planned. When Baca came back from the war feeling detached from society and coping with the aggression he’d picked up on the battlefield, he found healing after his wife encouraged him to go after an old dream of starting a dance company. He started Exit 12 on the famous Broadway street in New York City in 2007 and has been using the art form to tell stories of war since those early days. The first dance inspired by his experiences was “Habibi Hhaloua,” a ballet about his time in Fallujah, “about going through patrols, and about the things that go through your mind when you’re walking through the desert with an M-16 in your hand,” he said. Another dance, featured in the film, reflects on a specific encounter Baca had while searching the car of a young Iraqi couple with a baby. A few years into Baca’s new venture, tragedy struck when two Marine friends of his took their own lives. “It was a wake-up call to say, OK, I know we’re doing something through the performing arts, but I felt that we weren’t doing enough,” he said. 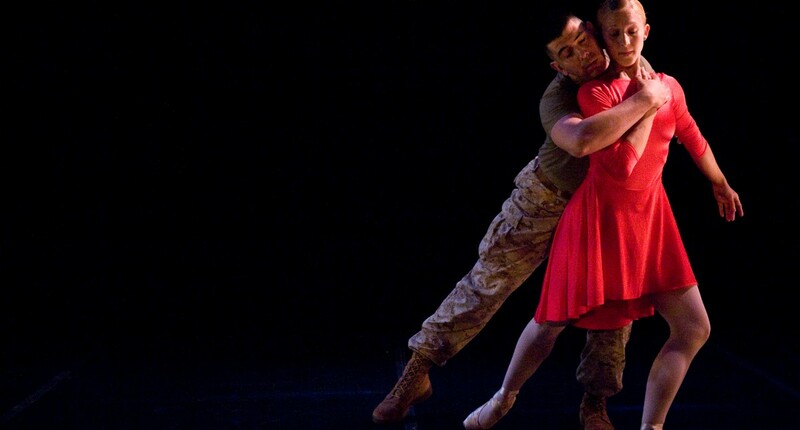 By the next year, Exit 12 had started incorporating dance workshops for veterans into its repertoire, hoping to use choreography to awaken veterans’ imaginations and promote healing from painful memories. “It was pretty powerful,” remembers Jenny Pacanowski, an Army veteran from Pennsylvania, who has attended Exit 12 workshops. Pacanowski said she has severe PTSD from her time deployed as a convoy medic responding to medical emergencies on the front lines. “I’ve done every therapy type that’s on earth right now,” she said. But what she really appreciates about Baca’s approach is that it’s not another version of sitting and talking about your experiences. “What a lot of people don’t realize is … your trauma lies in the your muscles and your body. And to create storytelling with body movement, combining those two, I think is part of the avenues of healing,” she said. One piece of the workshop that still stands out to her is when Baca told veterans to recall their military training for a set of violent action verbs — words like “hit”, “kick,” and “smash.” He instructed them to act out those motions as they were taught during military training, then repeat them harnessing positive human emotions, such as peace and love. Initially, Pacanowski was “pissed off” at Baca for suggesting the exercise, she said. But somewhere along the way, it worked. In all of Exit 12’s workshops, veteran attendees are grouped with civilians and professional dancers. “They can kind of encourage each other’s creativity and push each other’s boundaries so that the dancers aren’t just teaching veterans how to choreograph. They’re getting ideas from the veterans ... and together, everyone in the room is creating a dance,” Baca said. Pacanowski, now a poet who runs local arts workshops of her own, said it’s one way to bridge the military-civilian divide, especially when it comes to stigma surrounding PTSD and other issues. There’s another thing Pacanowski wants people to remember, too — that the arts aren’t “feminine or weak.” Ancient cultures often incorporated dancing into warrior homecomings and celebrations, she said. Exit 12 has more performances and workshops on the horizon, even while Baca is temporarily out of the country pursuing a master’s degree in fine arts from the Trinity Laban Conservatoire of Music and Dance in London. While there, he’s researching the impact of military training and its lasting impacts on the mind and the body, in hopes of finding ways to loosen those connections through choreography somehow, he said. Eventually, Baca would like to take Exit 12 to the global stage, working with Australian and Georgian militaries, in particular. And among his dreams are to one day do a workshop in Iraq — this time going in peace.